Intuit on Monday introduced SimpleStore for Facebook, an extension of Intuit's Web-based e-commerce software that provides secure online payments and personalized business websites. The new Facebook addition to SimpleStore will create a tab on your business page based off of the products currently listed on your existing SimpleStore website, complete with a shopping cart and secure checkout through Intuit Web Payment. It costs $35 per month. Adding a store to your Facebook Page is free for current SimpleStore users. SimpleStore creates an e-commerce tab for your Facebook page that integrates with your current Web store. Your current product catalog appears on your Facebook page, and changes to the catalog appear both there and on your website. SimpleStore for Facebook uses Intuit Web Payment, so your sales will still come through the same channel and funds will be transferred to your bank account just as if they came through your SimpleStore website, without customers having to leave your Facebook Page. Your customers can pay by credit or debit card directly on Facebook, with no additional login. 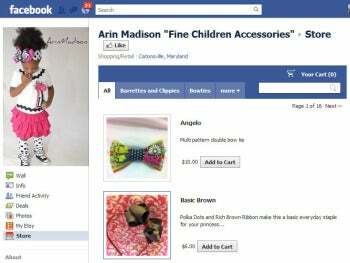 Erica Hunter, owner of online children’s accessories store Arin Madison, told Intuit that sales are up by 40 percent after three months of integrating her SimpleStore website with her Facebook page. “This tool will allow small businesses to be everywhere at once, capturing online shopping traffic through both their website and Facebook page.” said Barry Saik, an Intuit vice president and general manager. Alternative Facebook e-commerce products from LunarStore, Payvment, and TabJuice offer everything from a simple storefront with payments integrated with PayPal or Amazon, to enterprise-level analytics and viral marketing. Services like TabJuice and Payvment have free options as well. A good thing to think about when picking any Facebook e-commerce solution is which payment back-end system they will be using. For example, LunarStore offers secure payments through either PayPal Checkout or Amazon for $20 per month, whereas Payvment only works with PayPal, but offers a free plan. The various offerings also differ in terms of how many items you can put in your store and what amount of analytics they offer. The advantage to SimpleStore is that it comes with a personalized domain, email accounts, and hosting for your own e-commerce site in addition to integrating that same product information into your Facebook store. It also does not require a third-party payment service such as PayPal or Amazon, as it integrates with Intuit’s own Web Payment service.